“But I know exactly who she is, the girl thought, as the door closed. It was clear as day. She’s the girl I could’ve been, if life was fair, “ (202). 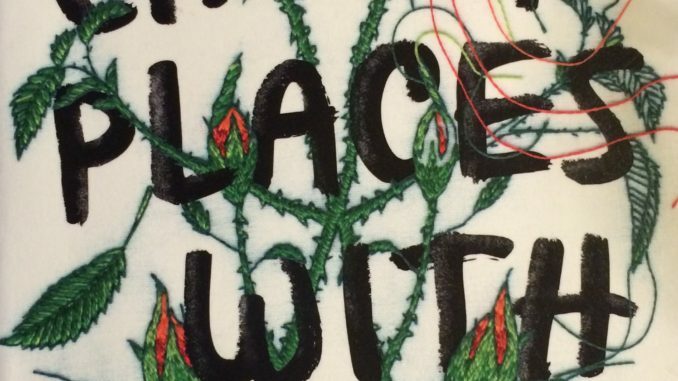 Change Places With Me, by Lois Metzger, is a book about a rather depressed girl, who realizes she does not need memory enhancement to be her true self. This book was written for young adults and is not a difficult read. Throughout the book, we follow a girl who shuts the world out without realizing it, and how she overcomes her saddness to become the lively girl she is at heart. Metzger uses an allusion, comparisons, and important morals in her novel. Clara is a sophomore in high school during the year 2036. She lives with her step mom, Evelyn, in New York City. Evelyn is always sending Clara to therapists and psychologists to try to help with her the grief she carries from when her father died when she was eight. She has no friends, except Kim from when they were “cross your heart friends” when they were eight years old. Clara does not go out of her way to make conversation with anyone and is scared of animals. During lunch, she sits facing a brick wall and does a crossword puzzle by herself everyday. She spaces out during class, and her one teachers, Mr. Slocum, who teaches biology, embarasses her in front of her class by sending her to the school psychologist multiple times. After Clara had her memory enhanced, she was called Rose. Rose has the opposite personality and style of Clara. “In bio lab the girl saw Nick Winter, diagonally in front of her, two tables over. Clara had barely noticed him; Rose had thought he was the most gorgeous thing ever,” (183) She was talkative and lively, and wanted to meet people. Rose even takes a job at a veterinarian’s office and enjoys walking dogs. She starts eating lunch with the two “most popular girls in school,” and they even convince her to have a Halloween party. However, Rose found Evelyn’s receipt from Forget-Me-Not, which she thought was a flower shop because she did not know about the procedure. She finds this to be false when her friend Cooper and her visit the zoo. Rose freaks out because the zoo is not how she remembered it a week ago. Cooper asks her if her memory was tampered with, but she can’t remember. Rose goes to Forget-Me-Not, and all is revealed. “We only erase the pain, flashed across the bottom of the screen. You’ll still be you with your memories in tact…a happier you,” (162). At the end of the book, Clara/Rose is given the option to have her memory enhanced again and she is all for it. She goes out looking for the girl she passed on the street that she so desperately wanted to be, but could not find her. “She scanned the mid afternoon crowds for a girl in a jean jacket with a rose embroidered on the back. It was simpler just to look for someone with very dark, chin length hair, with one side tucked behind one ear,” (186). After talking with Evelyn, which she never did as Clara, the girl realizes she can be happy without any tampering of her memory. Change Places With Me is somewhat realistic, although set in the future, and is a different look into young adult literature. This novel successfully intrigues the reader with an oddball character who stands out, but also does not at the same time. The protagonist of this book is seen in four different lights, which seems confusing, but makes sense with the plot of the book. The futuristic feel of this book is portrayed through different technology, such as hydro busses that always seem to be breaking down and hologram biology labs. The author, Metzger, explains the whole Forget-Me-Not situation with a science fiction feel. Dr. Star, the doctor treating Clara, uses metaphors to talk about life, “in some cases the memory is as fresh as the trauma itself and doesn’t diminish over time; it’s like a dog that keeps bringing the pain back to you, wagging it’s tail,” (168). These and flashy ads convince Dr. Star’s future patients that memory enhancement is beneficial to their happiness. Metzger makes a unique reference to Snow White in comparison to Clara. When Snow White eats the witch’s poisonous apple and appears dead, the dwarves put her in a glass coffin. Similarly, Clara has figuratively put herself in a glass coffin. She does not interact with society, and her view of the world is distorted as if she was looking through a thick piece of glass. Metzger is creative in telling her story and makes an allusion to a well known tale of envy. Finding friendship plays a huge role in the novel because Clara is not able to, but Rose does rather easily. Trust and safety come with strong relationships and because Clara/Rose needs to have people to rely on, she realizes people depend on her, too. The title of this novel is not misleading, because Rose actually attempts to transform herself into somebody else. This novel expresses how people can change for the better, by choice if they really want to. There are many life lessons that can be obtained from this distinctive novel. The fact that Clara/Rose does not end up going through with a second enhancement to her memory shows her growth from a inverted person to a person of integrity and self confidence. This is significant because accepting pain and loss is apart of grief, and taking the pain of losing a loved one away is not the best way to deal with it. Metzger alluding to Snow White was a clever way to use a well known story as a metaphor. Change Places With Me conveys the struggle everyone faces with losing a loved one, and how not everyone deals with it perfectly. Olivia Bigge’ is a junior at Clayton A. Bouton High School.